If you're a New Yorker, or ever have been one, the 92nd Street Y is pretty much iconic. It's where smart people go talk and smart people listen. You could probably say it's the ultimate intelligentsia destination, and since I'm someone who actually values academics, scholars, artists, and the intelligentsia, the Y is a big deal. And I'm going to represent BlogHer and moderate a panel of accomplished women there this February 16th. I know, right? I'm pretty stoked, to use one of the least intellectual words in my vocabulary. Ree and Kathryn were among our inaugural BlogHer Pathfinders at our inaugural Pathfinder Day, helping women see their path towards creating their own media "empire". This panel will be all about the risks and rewards that we face when forging new paths. 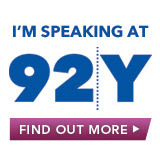 The common threads of self-expression, challenging one's self, and passing along the knowledge and wisdom we pick up along the way, weave through all of their stories, and I'm looking forward to bringing that to the 92nd Street Y's stage in February. I can giveaway a complimentary pair of tickets, so if you're a New Yorker (or close enough) and share what question you'd most like me to ask these panelists, I'll pick a winner at random. Come on, make my job easier: What do you want to know? Jory and Lisa are both on the list, and both in good company.